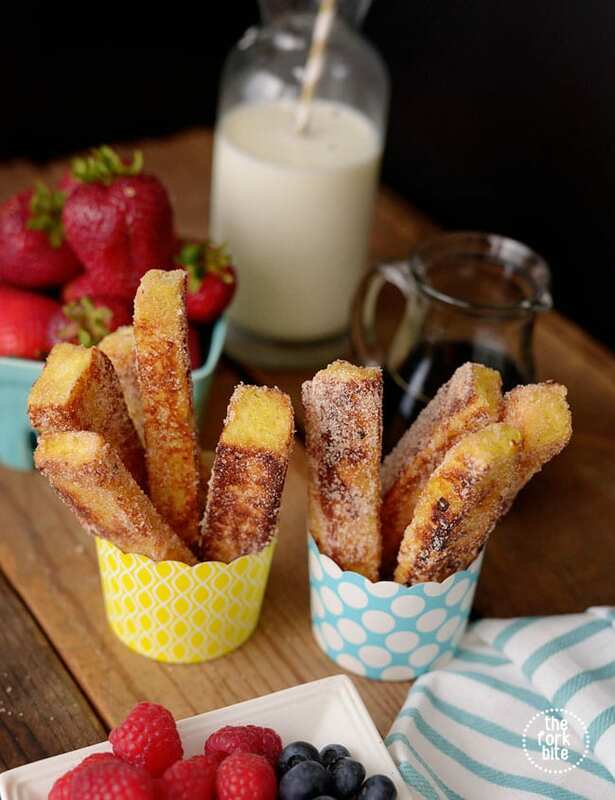 Easy Cinnamon French Toast Sticks – Breakfast you can eat with your fingers and dip in syrup, rather than pour syrup all over it. There’s something quite sensual about touching your food. Wow! What a great discovery! Maybe it’s the long-heralded taboo about playing with food, maybe it’s just the tactile experience, but if I could eat all my meals with my fingers, I would. Soup is perhaps the only food that doesn’t appeal to me as finger food, but you can put it in a cup and drink it! That’s one reason these dipping sticks were so appealing. Not only can you eat them with your fingers, there’s no plate with maple syrup smeared all over it when you’re done. Of course, you have to put the syrup somewhere for dipping, which is another use for my ramekin set. Since you coat these with sugar and cinnamon after you cook them, you don’t even need syrup for them to taste delicious. 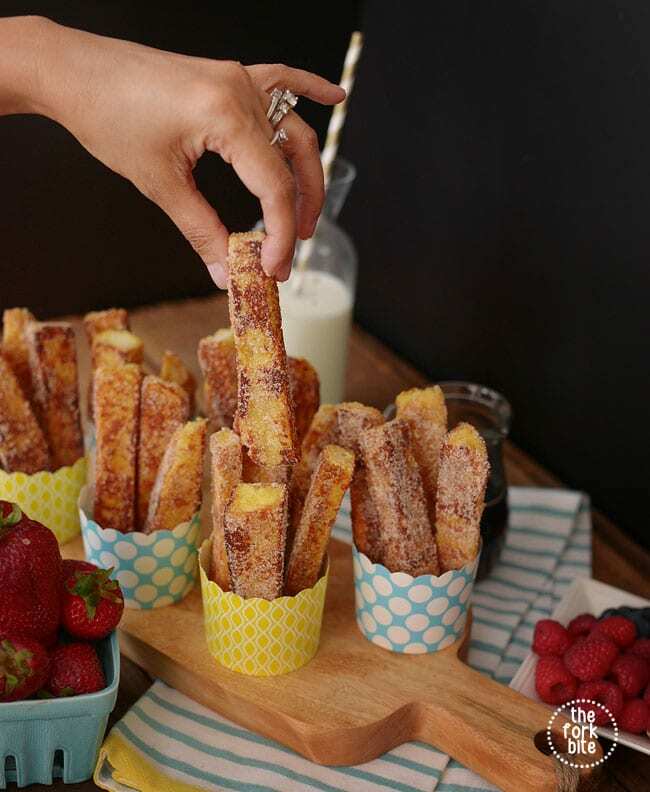 You can have plenty of fun with these easy cinnamon French toast sticks when it comes to serving them. They look like giant Legos if you’ve cut the crust off the bread before you quartered it, so you can build them up on the serving plate to create your own breakfast house and let the family do the demolition. All the cinnamon French toast sticks I’ve ever eaten has been a bit soggy and limp, not at all appropriate for eat-with-your-fingers food. 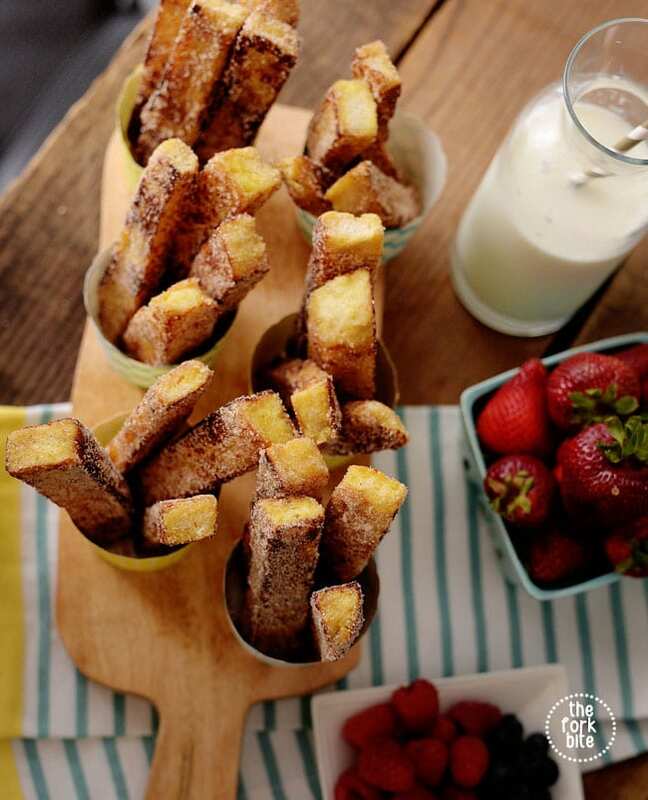 If you want your French toast sticks to hold their shape, you need to use stale bread. Bread that hasn’t been sliced is best since you can make the dipping sticks thicker, which helps them to be firmer and less floppy. While using stale bread may also be good for making regular French toast, somehow it wouldn’t seem the same it wasn’t a little limp. You’ll find some bread almost ready to use if you look for the quick sale or manager’s special bin in the bakery area of your grocery store, making the sticks a great bargain too! Breakfast you can eat with your fingers and dip in syrup, rather than pour syrup on your toast. Remove the crust and cut the bread into 4 sticks. Using a large bowl, mix the milk and eggs + a pinch of salt. Set aside. In another flat bowl, mix sugar and cinnamon. Cut the butter half and heat it up over medium heat. Quickly, roll the bread sticks into the egg mixture - make sure to shake off the excess and place in a pan. Put the bread sticks in the heated pan, turn each side until golden brown. Once done, transfer immediately in the cinnamon sugar mixture and roll to coat. This way, the mixture sticks easily when the bread is hot. Melt remaining butter and cook the remaining french toast sticks. Serve immediately and garnish with any syrup. I can so see myself making these for the next house party! Loved it! Love how simple this recipe is! It’s like french bread but simplified. I’ll have to give it a try. We love French Toast for breakfast over the weekends. Adding Cinnamon & Sugar is a great twist to the toast. I love this clever idea of using the leftover bread..I signed up to make treats for our school activity and these would be so fun to bring. I bet kids would love them! Me and my kiddo had a blast making them together!! They are so delicious and perfect for breakfast! I wrapped the leftovers in the foil and placed in the ziplock and froze them. And nuke them for 1 minute before serving. I love dunking my cinnamon sticks instead of pouring the syrup. Do you think we can freeze these sticks to make a quick breakfast? What a fun and delicious breakfast! Perfect way to start the day! These are perfect for our brunch table on Sunday morning. Can’t wait to make these sticks.these are too cute and yummy!! OMG!!! My family loves these cinnamon sticks. These are regulars in our breakfast table especially the weekends… luv it! This is really so yummy.. I have a sweet tooth and this is also perfect for breakfast. Yes! please. What do you do with the butter after you heat it? Do you think I can make bunch ahead and freeze them for later? 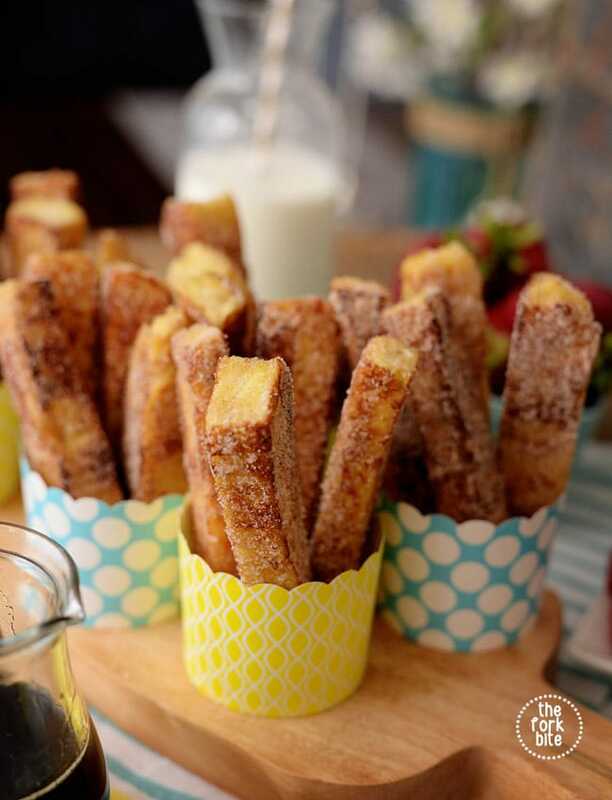 Wow these cinnamon sticks are so easy to make and they are everybody’s favorite too. My kids love them and they spent a lot on buying them from cafes and now I can also make it and save money. This is a great idea for breakfast. I will try making this. My kids would love it. This is such a nice twist for a sweet snack. Can’t wait to try them and I think my husband and nieces are going to flip! 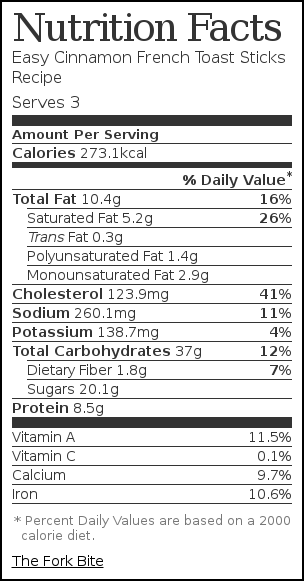 I love the idea of french toast sticks. My four year old love french toasts and he always want it cut up in little sticks. I will have to try your recipe. I’m sure he will love them! This would be great for the kids in the morning. These look delicious! They would be really cute for a brunch table set up, or even for a kids birthday! !